I have always been intrigued by the poster above, but was never quite sure what the actual effect of this illusion was. 'Maid of the Moon' was a creation of three people William Robinson, Benjamin B. Keyes of Boston and Will B. Wood. The original idea belonged to Wood who filed for a patent in 1889, but both Keyes and Robinson added things to the concept to take it from a novelty to an amazing act. The original name for the illusion was 'Astarte'. The illusion first appeared in Harry Kellar's show, as William Robinson and his wife Dot were both working for Kellar at the time. It was a revolutionary illusion for the time. The effect is a levitation where a woman floats upwards and can move up and down, left or right and even spin her body around and turn somersaults. The method was exposed in an article in the Chicago Herald newspaper, but it didn't stop Kellar from performing it. He would eventually alter the name of the illusion to Astarte-Maid of the Moon. In 1892, William Robinson and his wife Dot left the employment of Harry Kellar and went to work for Alexander Herrmann. 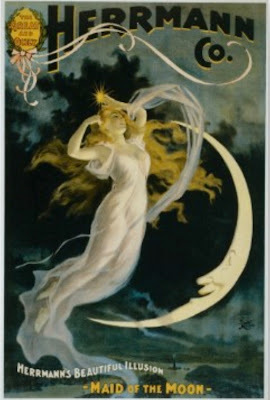 It's obvious by the poster, that Robinson either built the Astarte illusion for Herrmann or took it with him when he left the employment of Harry Kellar as it was included in Herrmann's touring show under the title 'Maid of the Moon'. I could not find a Kellar poster advertising Astarte, though he did advertise other levitations over the years. The Herrmann poster for the illusion is breathtaking, and honestly, more beautiful than the effect really is, but I'm judging it by modern standards and perhaps for it's time it too was incredible. In Kellars Wonders by Mike Caveney and Bill Meisel, there is a picture from the original patent papers showing the elaborate mechanics of the trick. Astarte was dropped from Kellar's show during his never ending quest for the ideal levitation. It was likely dropped from the Herrmann show after Alexander's death. As better and more realistic levitations were created, Astarte was soon forgotten. That is until 1980, when Doug Henning added Astarte to one of his World of Magic TV Specials. In this special he used Loreen Yarnell as his floating subject. The video below shows Doug Henning presenting Astarte. Enjoy! By the way, the above poster is also on the latest issue of Magicol Magazine. Great looking poster. Still waiting for my magicol to make an appearance. I love those posters too and thanks for the Doug!